Kye looks like a big tub of Duplo blocks – chunky, bright, friendly shapes that couldn’t possibly hurt you. And in Kye, they don’t. Even the game’s monsters, like a sentient, gnashing ball of teeth, seem about as menacing as a sticker. The building block aesthetic lends a little comfort to a game that otherwise loves to overwhelm you. Kye dumps large volumes of obstacles on you at once, leaving you awash in Crayola-colored junk with the hope that you can crawl your way out. Kye plays much like other puzzle games with pushable blocks. 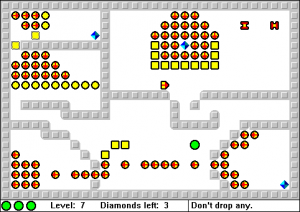 Small mazes of hazards and obstacles stand between you (a big green circle) and a handful of diamonds to collect, and if you aren’t careful, you can trap yourself or fall prey to a weird creature. The premise should scream familiarity to anyone acquainted with Boulder Dash and its progeny (Chip’s Challenge, et al.). 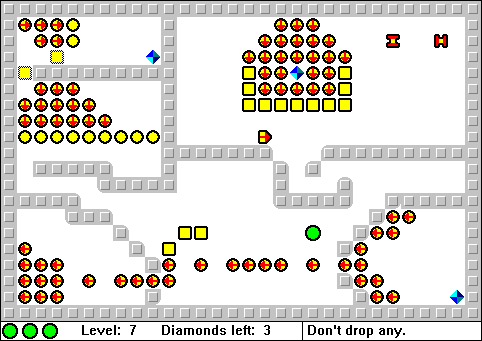 Two of the game’s obstacles, arrow-labeled blocks called rockies and sliders, will roll or drift in whatever direction they point until they get stuck. One or two can cause problems if they jam up a passageway, but Kye doesn’t rest with that few. You usually have to deal with dozens, all pouring out of a tiny slot and filling the screen with garbage. In those moments, playing Kye feels like opening the floodgates and fighting back against the current. The rolling onslaught will wreck everything unless you redirect it to wherever it will do the least harm, like an open space or a hall you don’t need to go down again. In other cases when areas have already filled up, you can use sticky blocks to pull some of the mess out, an act about as elegant as bailing out a boat with a coffee mug. Whenever rockies or sliders show up, the game becomes an exercise in frantic triage – though nonthreatening because you’re only engulfed by little yellow boxes. Levels play with that cascade effect more than any of the other available toys, and rightly so. Block avalanches are unique to Kye‘s playstyle and have a boatload of uses, especially in conjunction with other elements like countdown timers and vanishing walls. As levels disintegrate around you, some pathways close off while others open. You could become stuck under a pile of rockies, or they could bounce off the walls and follow you through the level. You’ll always have to struggle against parts of the level slipping out of place and clogging things up. The puzzles in Kye are more survivable than solvable. Nudge the rivers of blocks in the right direction, and you can keep moving once everything settles. If Kye looks like a Duplo city, it behaves like a kid trying to shake the bricks loose. 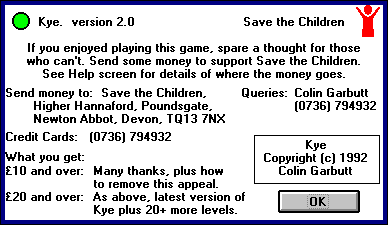 Later versions of Kye, which included editing tools and hundreds of levels, were sold as “charityware,” where a bulk of the £20 registration fee went to Save the Children rather than the author. Although this practice is now more widespread with game bundles, donation opportunities, and special marketed content, Kye was among the earlier games that raised money for charity. A myriad other versions of Kye exist, including the modernized Amazing Kye and the holiday-themed Christmas Kye Jr. See the Kye tribute site on SourceForge for all the variants.